A new wall mural has recently been painted in the front office of the Willamston Municipal Center. 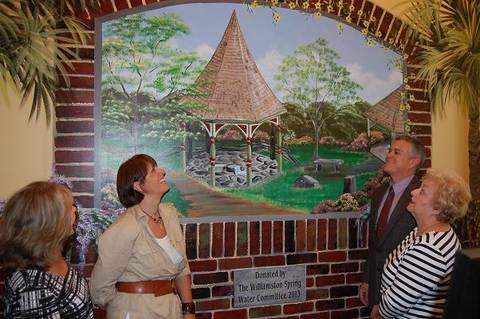 The mural, painted by Dacusville artist Jendi Lindsay, depicts the spring house gazebo and spring in Mineral Spring Park. Lindsay painted the massive wall mural which includes details right down to flowers, bricks and flowing spring water in just one weekend. The project was funded by the Williamston Springwater Committee. The Mineral Spring mural came about when Spring Water Committee member Dianne Lollis and town office employee Beth Elgin were discussing ideas of something for the wall behind the main office counter in town hall. Lollis said she was working on another project when she contacted Palmetto High School about the mural painted in their school library and was given Lindsay’s contact information. She photographed the actual spring and worked from that. The mural has the old split rail fence that surrounded the spring before a more modern fence was put up. Lindsay said that the mural needed something on the bottom to anchor it and she came up with the detailed brick wall. Lindsay said she has been painting since she was in high school and became hooked on large scale painting after a teacher involved her in a mural in the downtown area of her hometown. The talented artist has painted a number of local wall murals including one in the Palmetto High School library, Belton Elementary library, Fiesta Restaurant in Starr, Iva Elementary and at the intersection of Main St. and Greer St. in Honea Path. “I hope everybody enjoys it,” she said. Lollis and Lindsay are discussing another mural for the Bethlehem building in the park. Details on that project will be announced soon, Lollis said.